This handbook is available for free download from Mequoda. 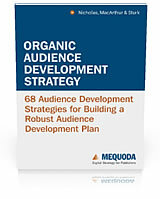 Organic Audience Development Strategy, based on Mequoda’s extensive experience in helping hundreds of publishing brands succeed on the Internet, focuses on the single most important activity a publisher must master in the Internet age: building a large audience of loyal, dedicated followers to whom publishers can repeatedly market their products. The handbook is geared toward legacy publishers wishing to improve and grow their businesses, and to entrepreneurs who recognize the Internet as a new way to find a voice and make money doing it. Sadly, many publishers today still fail to understand the strategies that could help them make millions in online publishing. Now Nicholas and his team have researched, documented and compiled all the proven techniques their niche publishing clients use every day to succeed and build publishing empires. Notes Nicholas, “If you’re looking for an easy answer to online publishing success, stop reading. We don’t have one. “We do know dozens of publishers who have made online publishing a large part of their revenue stream. And so Organic Audience Development Strategy starts by explaining the most fundamental concepts of organic audience development for publishers. It then turns to website architecture, which, to the surprise of many publishers, is critical in building a large audience. Nicholas explains how to convert unique visitors into registered users, digging into the finest points of architecture so readers can implement these strategies on their own. Organic Audience Development Strategy also delves into the all-important search engine optimization strategy, with step-by-step instructions on optimizing everything from website pages to marketing campaigns. Social media marketing, another misunderstood strategy, is explained in detail, with specific case studies and guidance for leveraging Facebook, YouTube, Twitter, Pinterest and Google+. The ultimate publishing and marketing platform, in Nicholas’ opinion, is email, and the handbook delivers detailed guidance on copywriting, email deliverability, analytics and email design. Templates for a variety of email types are included. Finally, Nicholas and his team have include eight fascinating and inspiring case studies of successful Internet publishers, from the might TIME to the more humble Mother Earth News. Co-authors of the book include other members of the Mequoda Group team, including chief content officer Ed Coburn, lead copywriter and blogger Mary Van Doren and managing editor Amanda MacArthur. Says Nicholas, “Our team is in a unique position to gather this expertise, because we’ve gained our knowledge from working with more than 100 publishers in the digital age, learning everything we could from our work, drawing on our decades of magazine industry experience in the trenches, and compiling a huge database of best practices and digital publishing tips. But why is the Mequoda team giving away a 250-page book? That’s a secret from one of Nicholas’ other handbooks, Multiplatform Publishing Strategy: 60 Digital Publishing Secrets for Making Millions Online. All these handbooks are available for free download at Mequoda’s website, or for purchase at Amazon. Don Nicholas, CEO of Mequoda Group, has guided the development of more than 110 successful niche media websites including Consumer Reports, HR Daily Advisor, Investing Daily, Johns Hopkins Health Alerts, Knitting Daily, Program on Negotiation at Harvard Law School and Vida Y Salud. He is an expert in new business development, digital publishing and Internet marketing. His team’s Mequoda Method books, reports and posts were downloaded more than 850,000 times last year. This year more than 100 publishing executives will attend his quarterly Digital Publishing & Marketing Intensive, where they will learn his comprehensive system for digital publishing and marketing. Mequoda Group offers training, consulting and development services for publishers to maximize their use of the Internet and other media outlets to create, build and retain long-lasting and profitable customer relationships. Tagged with Amazon, analytics, audience development, audience development strategies, Audience Development Strategies, audience development strategy, best practices, consumer reports, content, creating digital magazines, digital magazine, Digital Magazine Publishing, digital magazines, digital publishing, email, Facebook, internet marketing, legacy publishers, magazine, magazine publishing, magazines, managing editor, mary van doren, media, media websites, mequoda, mequoda method, mother earth news, multiplatform, multiplatform publishing, Multiplatform Publishing Strategy, niche publishing, online publishing, publishers, publishing executives, publishing secrets, publishing strategy, Search Engine Optimization, social media, social media marketing, subscription website, subscription website publishing, tablet, twitter, variety, Website Business Models, website publishing.